Youth Salute: Jaywon Kim (Scottsdale Preparatory Academy), Nicolas Basch (Desert Mountain High School), Emily Wood (Xavier College Preparatory), Alexis Scott (Desert Mountain High School), and alternate Alexandria Murray (Xavier College Preparatory). Youth Salute recognizes outstanding high school juniors and involves them in seminars and workshops specifically designed to further develop their already formidable leadership skills. Scholarships: Bob & Louise McCall - Visual Arts: Adam Montoya (Desert Mountain High School); Norval O. Tyler - Science & Technology: Daisy Barrera (Coronado High School), Alonz Hollis (Coronado High School); President's Award - Vocational Trade: Lawrence Lessig (Arcadia High School); Athletics: Megan Reniewicki (Arcadia High School), Lily Sandblom (Desert Mountain High School); Business: Alec Faubion (Desert Mountain High School), Elizabeth Munoz (Coronado High School); Performing Art: Renee Rule (Desert Mountain High School), Jeremy Yampolsky (Desert Mountain High School); Science & Technology: Morgan Freed (Desert Mountain High School) and Colin Lewin (Desert Mountain High School); Vocational Trade: Lauren Anderson (Desert Mountain High School), Anju Bhujel (Arcadia High School). Through the Club's Foundation, it awards annual scholarships to outstanding graduating seniors attending Scottsdale Unified School District high schools. Scholarships will be paid directly to the institution on the winner's behalf. Rotary Youth Leadership Academy (RLYA): Julius Objeijn (Chaparral High School), Leah Randolff (Arcadia High School), Alexandra DeWeese (Pinnacle Peak High School), Ashley Norman (Desert Mountain High School), Nataly Cano (Coronado High School), Alma Atassi (Veritas High School), Rachel Zoneraich (Scottsdale Preparatory Academy), Nadia Sawaf (Veritas High School). Guided by Rotary's Youth Services philosophy regarding youth, the RYLA Camp is structured to challenge the students to discuss problems confronting today's youth and to give participating adults the opportunity to listen to their suggestions and devise methods and activities for resolving their concerns. 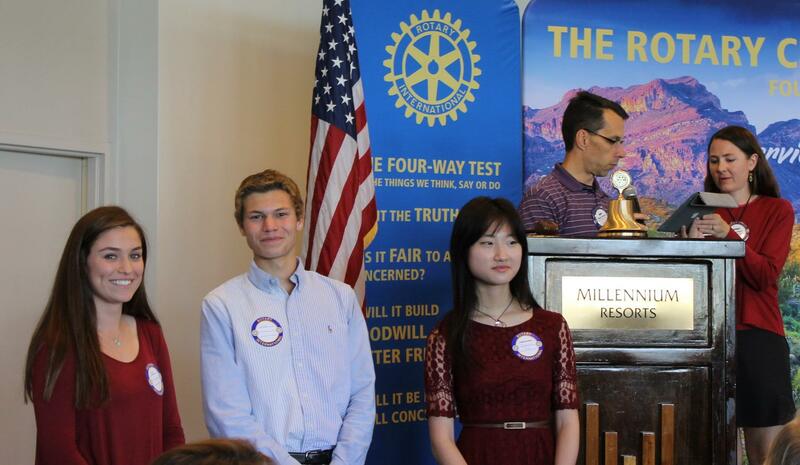 The Rotary Club of Scottsdale sponsors the Barker Keystone Interact Club (Beethoven Felix - Teen Development Specialist); Chaparral High School Interact Club (Keri Board - Guidance Counselor); Coronado High School (Steven Conrady - teacher); Scottsdale Preparatory Academy Interact Club (Diane Sterner - College Counselor). Rotary Interact Clubs give students ages 12-18 the chance to make a real difference while having fun. Every Rotary Interact Club carries out many service projects a year to help their school or community and/or promote international understanding. The Rotary Club of Scottsdale sponsors Rotary Youth Exchange Students each year: two in-bound (2015-16 Julius/Netherlands and Leah/Germany; 2016-17 Gijs/Netherlands and Pei-Lin/Taiwan) and out-bound students (2015-16 Annie/Belgium and Cooper/Netherlands; 2016-17 Alexandra/Netherlands and Ashley/Taiwan). Youth Exchange is a study-abroad opportunity for young people who spend a full school year as an international student hosted by local Rotary clubs. Additionally, the Rotary Club of Scottsdale offers adult vocational scholarships via The Rotary Vocational Fund of Arizona. Two vocational scholarships totaling $4,750 were awarded to two adults to attend East Valley Medical College to pursue lab tech studies. Upcoming Rotary Club of Scottsdale luncheon meeting speakers include: on May 16, Cindy McCain and on May 23, Eileen Klein, President of the Arizona Board of Regents. 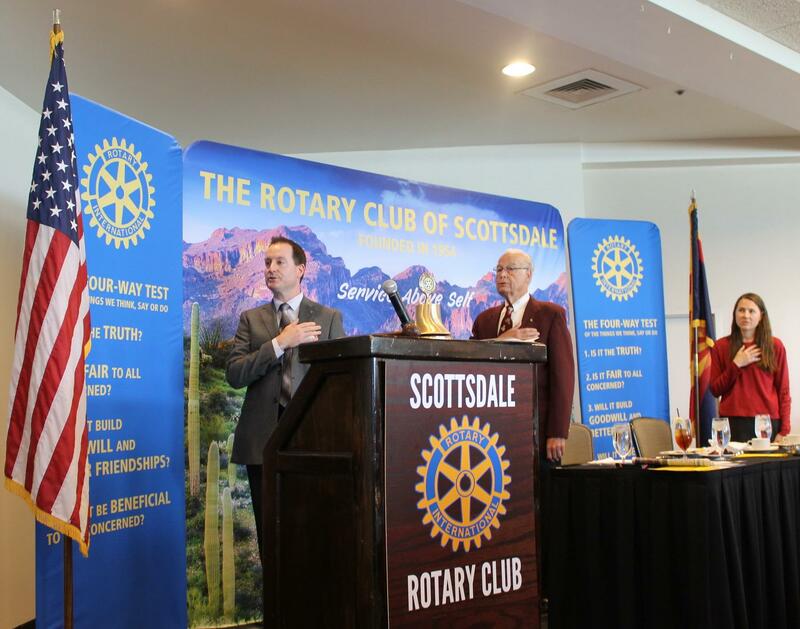 For more information about Rotary Club of Scottsdale's upcoming speakers, projects, programs, and meeting dates/locations - go to www.scottsdalerotary.org.